Following widespread usage on farms across Europe, and a series of successful recent calf feeding trials in Denmark and Germany, Azelis Animal Nutrition is pleased to launch Sangrovit®CS to the UK market. UK dairy calf rearers now have access to a proven natural herbal-based feed ingredient that can be easily mixed with milk replacer to promote improved gut function in young calves during and beyond the crucial first few weeks of life. Speaking at UK Dairy Day, Antony Wildon – UK technical development manager with the company – highlighted the nutritional benefits of what is a standardised formulation of dried, ground and granulated extract of the Papaveraceae plant Macleaya cordata, which has been combined with organic acids. “The active substances in Sangrovit®CS are isoquinoline alkaloids (IQ), which have been extensively studied and used in human medicine due to their anti-inflammatory properties. But in farm animals these important alkaloids are also valued for their antioxidant and gut protection properties, as well as their positive effect on feed intake,” he said. He explained that in recent European trials – where newborn calves were fed Sangrovit®CS in their milk replacer from day 3 of life until day 21 – the youngstock continued to hit normal feed intake, growth and health targets even while under challenge from common diarrhoea pathogens. “Sangrovit®CS promoted excellent health and vitality by helping the calves’ gut wall continue to function, despite the scour-pathogen threat,” he said. 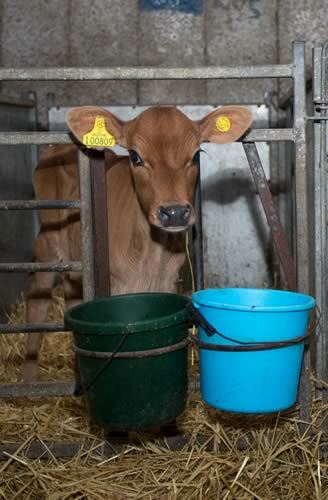 “Although good colostrum feeding and hygiene practices are important prerequisites for successful calf rearing, these latest trials do suggest natural feed ingredients can play an important role in promoting good early life calf health and performance when we know the die for productive lifetime performance is set,” Mr Wildon added. Sangrovit®CS is available as a light orange powder in farm packs and mixes easily with milk replacer at the rate of 10g per calf per day. If bucket feeding twice a day simply add a 5g scoop to each milk feed.